The most recent family attempt at saving cats of the world, one kitty at a time, actually began about 3 years ago. 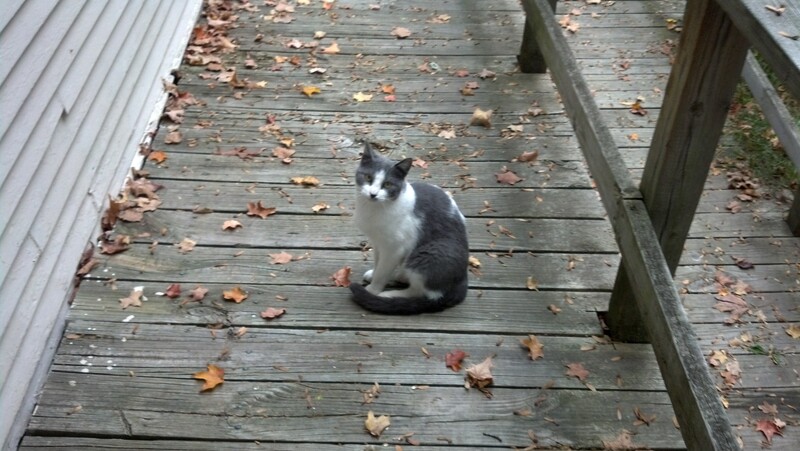 There was a cat outside, very friendly, that looked like a washed out version of our indoor cat. A gray rather than black tortoise. 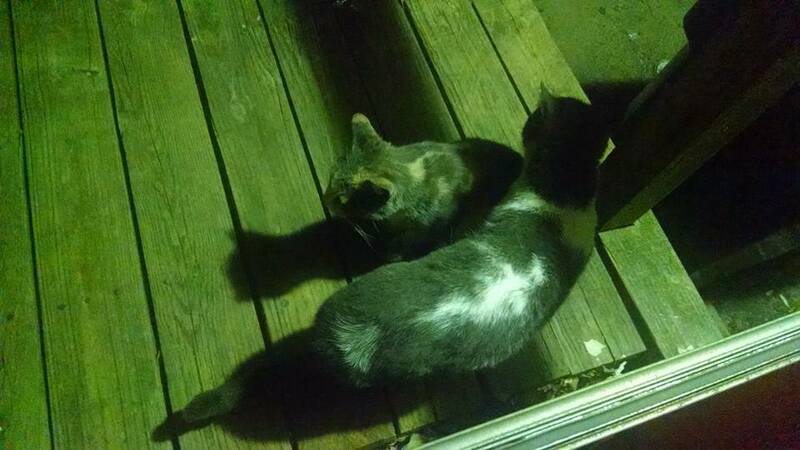 We noticed a fluffy gray and white kitten following her. She would come up to the back door, he would sit 40 feet away in the weeds. He was truly a feral cat. Tom slowly coaxed him closer and closer, until you could reach down and pet him. Ben was living at home, and had his own cat. 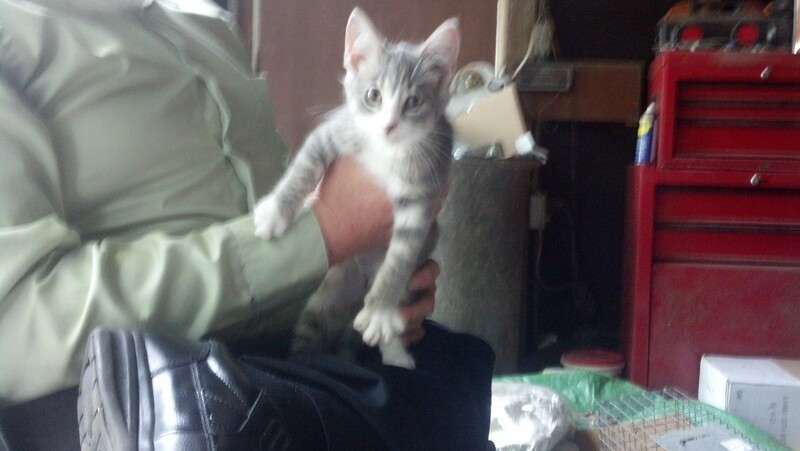 However, Ben and Tom decided they could bring him into the house, and he would be Ben’s cat. After our past history with rescues, the first step was to take him to the vet to make sure he was healthy. (Version 1.0 will be a later post, with that whole story.) He was healthy, so we had him neutered (at C-Snip). Unfortunately, just a few short weeks later my mother-in-law passed away, and the last time she got kittens my brother-in-law said someone had to promise to take them if anything happened to her. We knew how much cats meant to her, and we expected her to live a long time, so of course we said we would take them. Now we had 5 cats in the house! Can you guess who named them by the names? 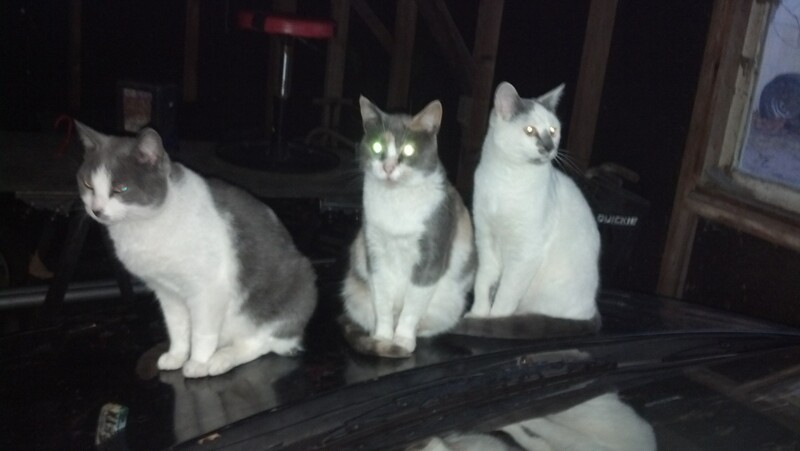 Mandu, F’lar, Zedd (named for Zeddicus Zu’l Zorander,) Buffy, and Muffy. We continued feeding Zedd’s mother, who we creatively named Mama. We always meant to take her to C-snip, but never did. She had a litter just before we took Zedd in. She regularly had litters of kittens, which never survived. One had from this group. It was white and gray, and had what looked like a white cross on its back, so Tom called it Chrissy. 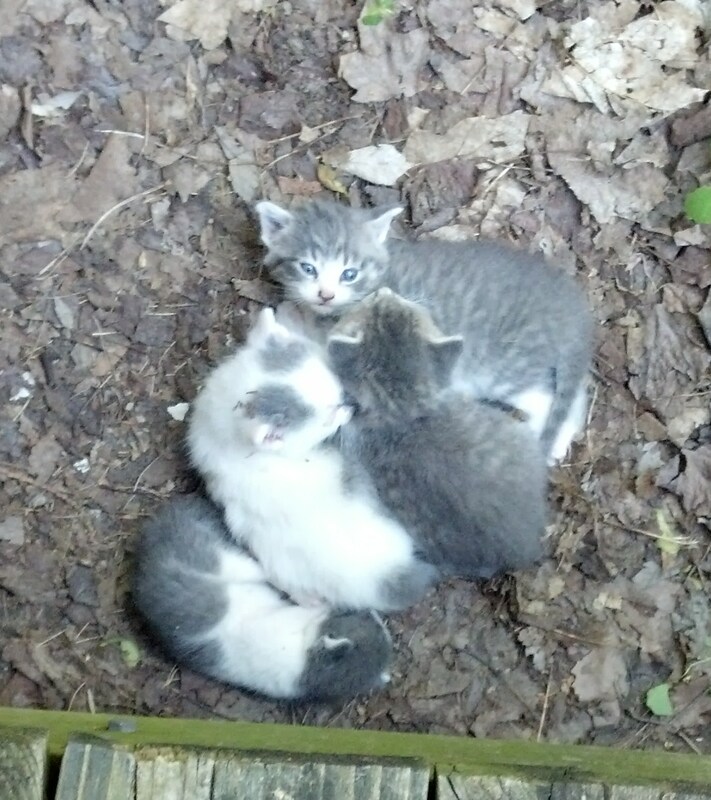 We wondered if Chrissy was a boy or girl, until the day I looked off the side of the deck and saw her with 4 kittens. One was very weak and didn’t live much longer, but there were still three. 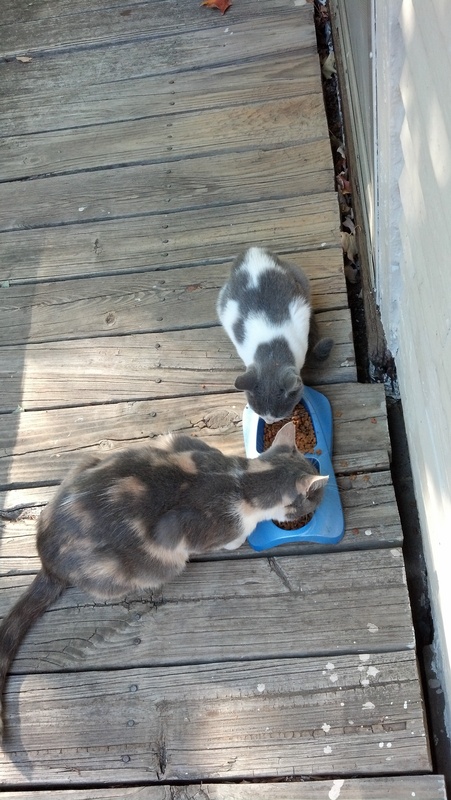 We hadn’t seen Chrissy for several days, so we caught the kittens and put them in a cage with food and litter. 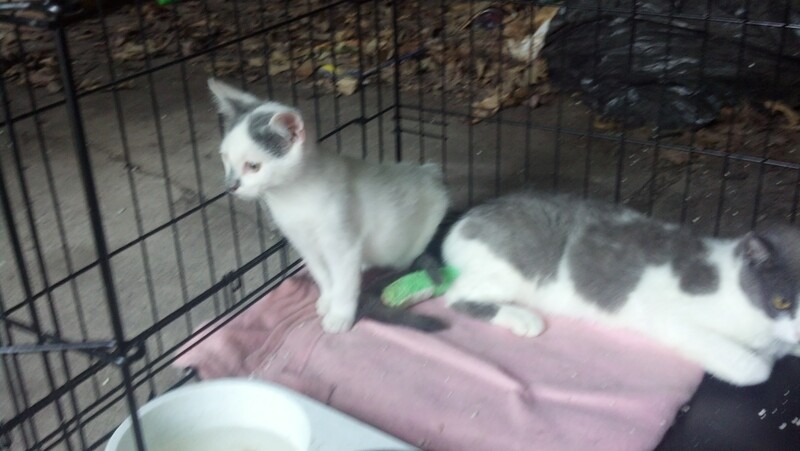 We were heading out of town for a few days, then would take them to be neutered and try to find homes for them. 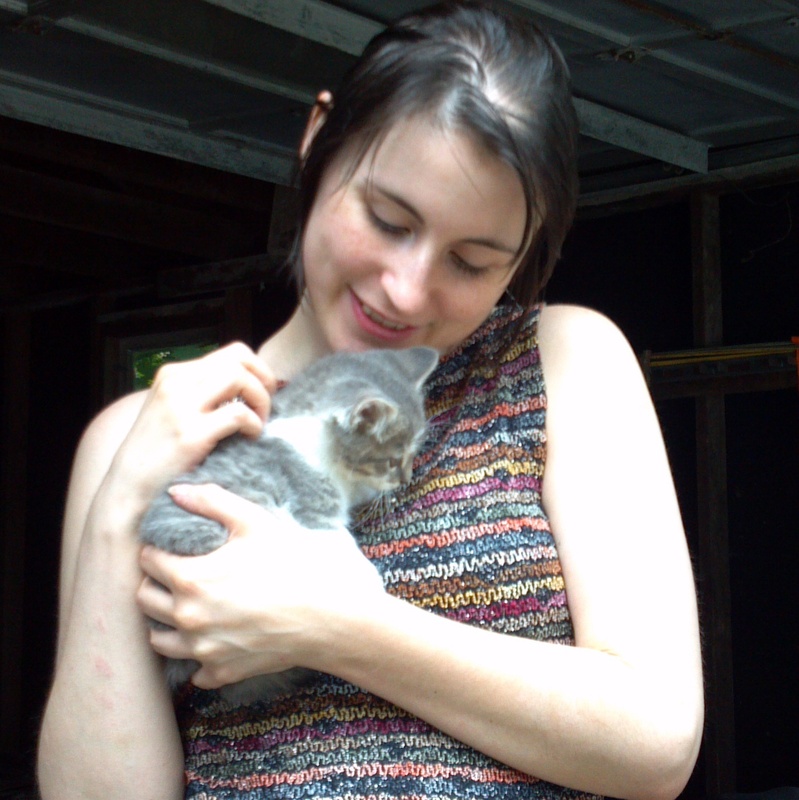 Chrissy showed up after we left, and Ben caught her and put her in the cage with the kittens. She had been gone because she was hurt, so when we took her to the vet, she needed surgery on her leg. Since anesthetic is the most expensive part, we had her spayed at the same time. This meant 6 weeks in a cage to heal. then took the other two to C-snip. Anna decided to take the little girl. We let them out of the cage, but continued to feed Mama, Chrissy, and Lucius. 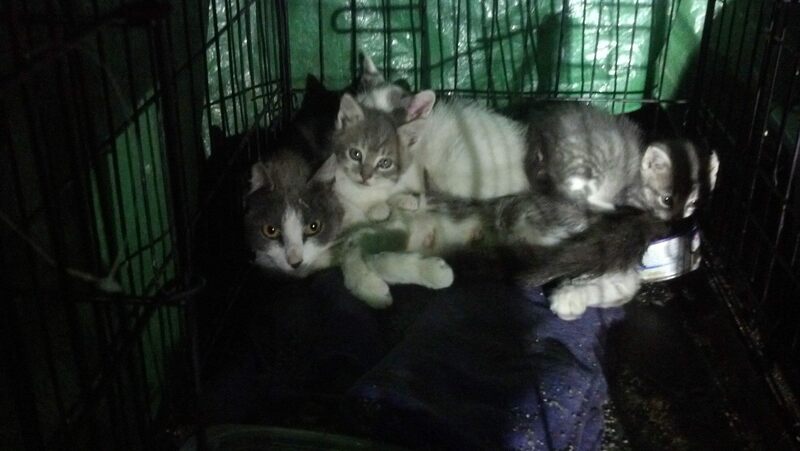 We did this for over a year, even brought them in (in a cage) for the coldest couple weeks of the winter of 2014. By then, Mama, Chrissy, and Lucius were all about the same size. Then, last fall, right after Labor Day, we never saw them again. A neighbors dog, and us being gone for a couple days, must have been too much. I wished we had taken Lucius in, but we didn’t think Chrissy would survive without him. So which one reappears a few weeks ago? : Chrissy! 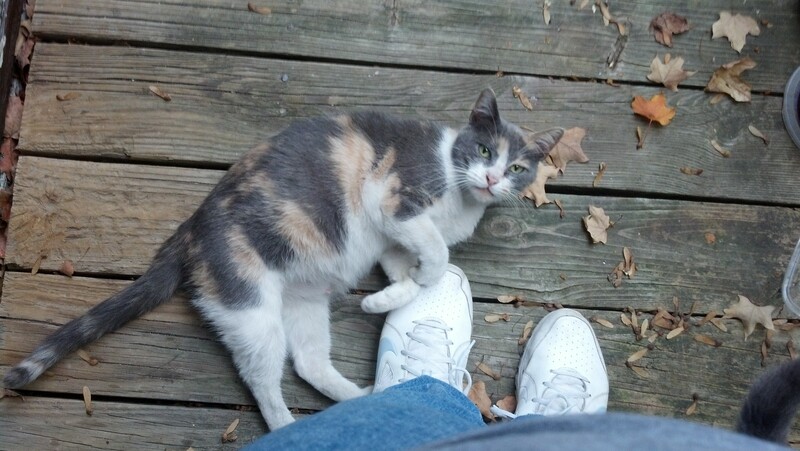 Afraid of the neighbors dog, but showing up every day for food and petting. So we’re back to the old dilemma–do we bring her in? Ben moved away with F’lar, and one of Grandma’s girls (F’lar and Zedd did not get along.) Can we handle 4 cats in the house, with two (Chrissy and Mandu) afraid of everything? Update: Mama showed up Monday, don’t know if she’ll stay. This entry was tagged cats, family, feral, kittens, rescue. Bookmark the permalink.